Like many motorcycle riders, I take special care of my bike and have been concerned for some time about ethanol in our fuel. I must admit the bike runs very smooth, starts instantly and all indications are it keeps the fuel system clean. 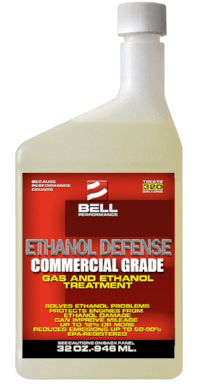 The most dramatic benefit I've noticed is from using Ethanol Defense in my lawn mower. The mower is a Honda (very good mower) but has a very touchy fuel system. Even though great pains were taken to use fresh, clean fuel, the engine began to surge heavily. It just wouldn't idle at all. I took the mower to the dealer - their solution was to replace the carburetor with a new one. The fix lasted one year and the problem returned. After using Ethanol Defense for one mowing season the idle returned to a smooth steady purr. It's always great to hear from satisfied customers. Thanks, William!